Why do you need a solution? Outlook Cache – the traditional recommendation was to always have Online mode set when connecting to exchange to ensure no OST was required to be saved in a profile. With Office365 now on everyone’s radar/to do list this recommendation has now been reversed due to the latency and reliability not a guarantee/not located in same data centre. End user experience is always a key priority and this has driven the requirement for cache mode to be used to ensure optimum reliability/access. This means an OST (could be up to 50GB mailbox size) must be created in the user profile and saved to the profile solution of choice (if any used) causing login delays or re-created everyone login adding some delay to outlook re-population of mailbox. Outlook Search/Indexing – Search index is stored per-computer, this does not follow the user, effectively disabling the real-time search option in Outlook. As searching in outlook is necessity due to the volume of e-mails we all receive/send daily it can have a productivity impact to the users and is a key requirement to provide first class experience. OneDrive for Business – with Onedrive for business included in Office365 subscription it allows up to 1TB of data storage per users to be available. This data is sync’d using the OneDrive for business client to the Server/Session in it entirety. What’s products solve my problem? All of the solutions use VHD/VHDX which use Block Level transfer introducing significant improvements to access to large files such as OST/PST Files or complete profiles. Below is a quick review on the products. The context to this article is based on adding one of the above products to an existing profile solution to solve your problem. Full profile solution are also available and are covered off at the end of the article. This name is somewhat misleading as at the moment it only support Outlook. Like the other products in the comparison it is attaching a VHD file during login to redirect the outlook folder into user profile. If you’re an existing app layering customer and need to address only outlook then it will meet your needs with the possibility of more enhancements being added in the coming months in newer app layering versions. It only addresses 1 of the 3 challenges highlighted , but adoption of OneDrive for Business may be optional in many organisation in which case the Indexing/Searching could also be a limitation imposed on the solution owners to end users. Management : Managed through App Layering Management. This news didn’t make into the keynote speech , but was hidden within a session titled “Manage your user experience from Workspace Environment Management Service“. 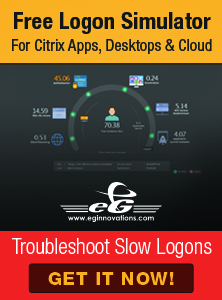 It is a step in the right direction for citrix and is certainly going to ruffle the feathers of other product vendors who have being doing this for a while. It addresses 2 of the 3 challenges highlighted , but adoption of OneDrive for Business may be optional in many organisation. Limitations: No Concurrency but rumour of multi-session support , Limited to Citrix UPM as profile solution, no cloud storage option. Note: If you bundle Application Layering User Layers with Citrix UPM then OneDrive for Business will be provided. With the combination of Writable App Volume & VMware UEM VMware Outlook cache roaming & Search Index between non-persistence sessions is now possible. App Volumes allow a per user writable volume to be created and made available , this is created in the following location “C:\SnapVolumesTemp\writable”. This roams with the user onto each session as the volume accessible after user login. Using VMware UEM adjust the ADMX “Default Location for Outlook OST” to redirect the OST location to the App Volume that will roam with user to “C:\SnapVolumesTemp\writable\Outlook” allows the Outlook Cache to be written to User volume. It addresses 2 of the 3 challenges highlighted , but adoption of OneDrive for Business may be optional in many organisation in which case the Indexing/Searching could also be a limitation imposed on the solution owners to end users. Office365 container is a profile agnostic solution that can be deployed on any existing Server Based Computing (SBC) solution, it has the benefit that you don’t need to transition your existing profile into its own profile container solution (FSLogix Profile Container) to take advantage of the features. It addresses all 3 of the challenges highlighted, with additional benefits of Skype for Business GAL/OneNote and Teams. It also includes concurrency allowing multiple logins which could be common on Xenapp/RDSH environments. See more on my blog on concurrency FSLogix -Concurrent access to O365 Containers VHDAccessMode Explained! Storage Location: Can be stored in any file location local(on-premise) or remote(cloud) with examples in AWS & Azure demo’s been published. See my article on Cloud Cache FSLogix – Cloud Cache “CCD” Overview for interesting developments on containers locations. Although not related to this analysis it is worth referring. The ivanti solution does exactly what the title says, it is mainly driven by an environment manager (AEMP) configuration during login (Pre-Desktop or Desktop Created) running a number of predefined actions to create and attached a VHD file and redirection of the outlook folder in user profile, OneNote and Skype for Business GAL as well as OneDrive now. At the minute, the search index is only for Single Session (VDI) but it is expected that it will support RDSH in the next release due Jan 19. In addition to the One Drive Cache Roaming for virtual sessions feature, Environment Manager 2018.3 also now supports concurrent user access for Office 365 VHD containers.This enables a user within a non-persistent Windows environment to have multiple sessions running at the same time, for example to access Outlook from multiple virtual sessions. Credit where credit is due, Ivanti has stepped up in the last 6 months to delivery these features that users are asking for and are closing the gap quickly compared to some of the other products. It addresses all of the challenges highlighted , but Indexing/Searching is limited to single session(VDI), could also be a limitation imposed on the solution owners to end users. ProfileUnity with Profile Disk allows you to have users’ entire profiles on a provisioned VHD or VMDK. VMDK support is definitely a exclusive feature only offered in Profile Disk as the other products compared are VHD/VHDX based. ProfileDisk essentially off-loads the entire user profile to disk for optimum performance and flexibility to a fileshare (local or cloud) and injecting during the login process allowing profile to load in seconds. It is now possible to be selective in profile unity/profile disks to not capture the entire profile and only target the specific O365. The below article was created showing OST/Outlook. Also see my article on Liquidware Profile Unity & Office 365 Caching, and putting the configuration into practise. Further testing around OneDrive etc needs to be completed in the same manner as above to remove the profile agnostic “X” but i’ll test update when i can validate the configuration. It addresses all 3 of the challenges highlighted, with additional benefits of Skype for Business GAL/OneNote being addresses as complete profile is being migrated. It has to be noted although Outlook Search/Indexing is available , it is only for single user environment(XenDesktop, VDI etc). Using Search/Indexing in a RDSH environment would require indexing to be done per RDSH server which although technical possible in RDSH is is lottery if the next server you connect to contains your Search/Indexing database. Management : Managed through Profile Unity Central Management console. Storage Location : Can be stored in any file location local(on-premise) or remote(cloud) with native support for Azure Blob, Amazon S3 and Google Object Storage. As already covered in the following article. Limitations: Does not play well with other products, No Roaming Search Index or support for OneDrive. Liquidware ProfileUnity – It meets 2 of the 3 requirements to address the challenges( Indexing/Search only available for single user environment with RDSH possible but would be inconsistent therefore the tick in table is amber). Without profiledisk being used OneDrive is not yet available with being profile agnostic which is the final requirment which it does meet. Citrix WEM/UPM – It meets 2 of the 3 requirements to address the challenges + you are also tied to UPM Profiles so it is not profile agnostic. VMware App Volumes – it addresses two of the challenges with both OST & Search Index being redirected to writable volumes. App Volumes is limited to VMware datastores. Microsoft UPD – it only addresses one of the challenges + Partially profile agnostics as it won’t work with all other full profile solution. testing has shown it works well with AppSense, but won’t with Citrix UPD. Citrix App Layering (Office 365 Layer) – App Layering – it only addresses one of the challenges, it is tied to Citrix User Profile Manager. Moving to a Full profile solution? This context to this above sections are based on adding one of the above products to an existing profile solution to solve your problems. Additional you can choose to move your profile solution/expand your existing solution by bundling products (i.e UPM + App Layering). Liquidware ProfileUnity – It meets 2 of the 3 requirements to address the challenges( Indexing/Search only available for single user environment with RDSH possible but would be inconsistent therefore the tick in table is amber). Without profiledisk being used OneDrive is not yet available with being profile agnostic which is the final requirement which it does meet. App Layering Full User Layers – It meets 2 of the 3 requirements to address the challenges. Microsoft UPD – It meets 2 of the 3 requirements to address the challenges. The OneDrive is Orange tick due having to exlcude OneDrive in UPD and place the file elsewhere. Next Citrix Cloud – Cloud Connector in-depth review. Hi David, a fair assessment of the state of play about 6 months ago with our Ivanti Best Practice configuration. This is a solid solution that customers and partners have used with great success, also solving not just Cached Exchange Mode a lot of other cache issues with Adobe, Chrome, Java amongst others. Most importantly (for customers!!) all without the need to purchase any additional products/licenses. Regarding Multi/Concurrent access after working with our customers through this 1st release we decided to concentrate on control for Session(or network)Disconnect/Lock scenario’s with Multi-Access to follow. UWM 10.1 FR4 will GA in February and we’d be happy for you to try this out. I am reflecting current available solutions, the review is based on the “Roaming an Outlook Cache in a Non-Persistent VDI/RDSH Environment” which yes was published over 6 month ago but points are still valid. I am also aware of other issues it can help with around adobe,chrome,java etc but i wanted to keep this O365 focused. Happy to try out 10.1FR4 when available and update the article in reflect on the product being GA.
Great article, would you be interested in testing TPMM, it solves the outlook cache issue only but it is free. David, Thank you for your coverage. Our ProfileUnity Office 365 solution is profile agnostic. We can run in tandem with Citrix UPM, VMware UEM, native profiles, etc. Secondly, can you please list VMDK support in your matrix? As you point out. it is a nice to have and deal maker/breaker for many enterprises. Yes, by default (in ProfileUnity’s guided configuration) we’ll grab the entire profile for ProfileDisk but we can also break out just the Office 365 piece with our VHD/VMDK profile containers. Citrix UPM, VMware UEM, standard profiles, etc continue to run either way if the customer wishes, leaving our solution platform agnostic. Great article, David! Thanks for letting me use your chart for my Masters Retreat session. Cheers! Thanks Rory, my pleasure and thanks for your continued support. Hi David. Great article. Just wondering if you have an update on the summary table as of June 2018. Lots of new releases have come out (e.g. App Layering 4.11 and IvanTI RES), We are in the middle of some decision making and although your article is spot on my feeling is that it needs a refresh.